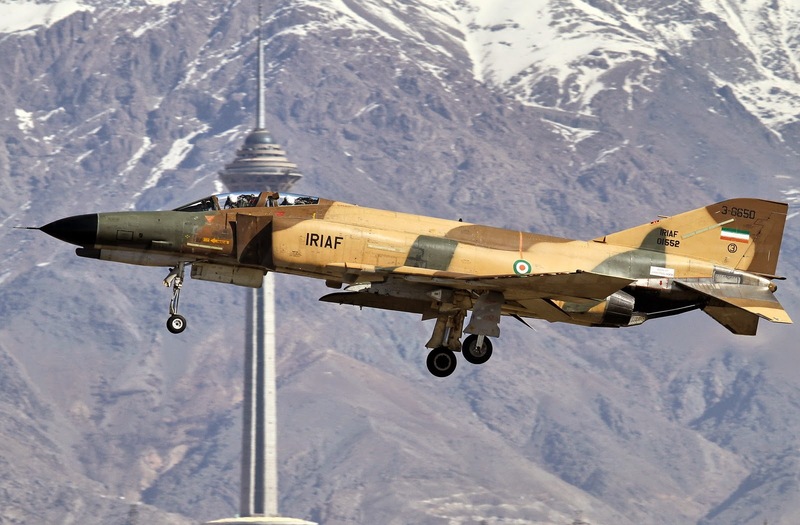 An IRIAF F-4E Phantom II fighter jet crashed in southern Fars province on Tuesday. The pilot and the co-pilot were killed. IRIAF Brig. Gen. Hossein Mohammadi, the Air Force commander for Fars region, confirmed the news late today. Last September, another F-4E fighter crashed while landing at Bushehr AFB, killing its pilot. Two other F-4s also crashed in 2010 and 2012 in Bushehr and Bandar Abbas respectively. Iran purchased some 260 F-4s during the Shah’s government in late 1960s and 70s. The first combat use of F-4s was in 1975 when the Shah supported Omani government against the separatist rebels in Dhofar. The F-4s also played key role in the 8-year Iran-Iraq war. To this day the F-4 remains the workhorse of IRIAF, with an estimated 55 F-4s still operational. Last year, the Phantoms were fitted with Qader anti-ship cruise missiles to give Iran air-launched cruise missile capability. The F-4Es crashes are mainly due to low-level flight trainings. Iranian pilots have a fine tradition of extreme low flight training with both F-4 but also F-5. The training structure is purely developed by Iranians after long experience from Iran-Iraq war both on the Iranian side but also on attacks from Iraqi side conducted by foreign low-flight experts from South Africa and Belgium on French Mirage against Iranian targets mainly in the Persian Gulf. Iran structured the same sort of training with help of foreign advisers for its Mirage fleet which escaped to Iran from Iraq after the first Persian Gulf War (liberation of Kuwait). Interestingly some of these advisers had previously worked for Iraq against Iran. Iranians have extensive low-level flights experience and training from both mountainous areas but also desert and sea. They have tried to compensate the lack of advanced stealth technology by these types of under radar flyings. They have also lately focused on long-range low-level flight during night with extra fuel tanks for specific distant targets of interest. Some of the other F-4 crashes are due to testing new heavy ammunition on the F-4s, especially different types of cruise missiles. Specifically the crashes in Chah Bahar and Bandar Abbas in the recent years are related to these types of tests. The crash in Bandar Abbas was due to the test of medium range anti-ship missile with maximum operation range of 300 kms. Rumors say the plane successfully took off and fired the missile but somehow shortly during that procedure ran into flight problems and crashed. The missile however successfully traveled towards its target in north of Persian Gulf alongside Iranian coast and hit it. The crash in Chah Bahar was due to test of long-range subsonic cruise missile with maximum range of approximately 3000 kms. A non-operational replica of the missile was mounted on a F-4 in order to conduct different flight tests but unfortunately the jet ran into problems immediately after the take-off and crashed into the sea. Rumors say Iran has later on tested this cruise missile on its Su-24 jets some of which have now been covertly forwarded to the Chah Bahar base and equipped with night vision capability. The main mission of these bombers equipped with long-range cruise missiles is to secure potential distant "source of attacks" targets in the Indian Ocean can be reached and destroyed both on the ground but also at sea. This is the first time ever that a long-range subsonic cruise missile has been mounted on a Su-24 in the world. what's your idea about the age of these phantoms? they are very old and Iranian air fleet has problem for repairing and maintenance of these phantoms due to the boycotts! You have a point on that, some of these crashes might be due to fatigue and age but not to maintenance. The last thing Iran has problem with is maintaining F-4, F-5 or F-14. They have a large inventory of repair parts imported from different sources during a long time and they are also very good in re-engineering many of the parts by themselves. Most of the electronics and some of the avionics are upgraded so the original American manufactured parts are no longer needed. F-4s are old but Turkey is still using it and Germany retired it just for 1 year ago, so yes they are old but the two above cases show even old aircrafts can be used if maintained well.